【GREAT FOR TONING ARM & LEG MUSCLES】Compact pedal exerciser can be used to strengthen arms and legs, increasing circulation, improving stamina and relieving tension for greater focus and concentration. Quiet and smooth pedal operation allows the pedal exerciser to be used in the office as well as at home. Use while on your phone, watching tv, or playing video games to include beneficial exercise in your day. 【FITS UNDER ANY DESK】Compact design is 11.8" high, easily fitting under a desk or similar space. 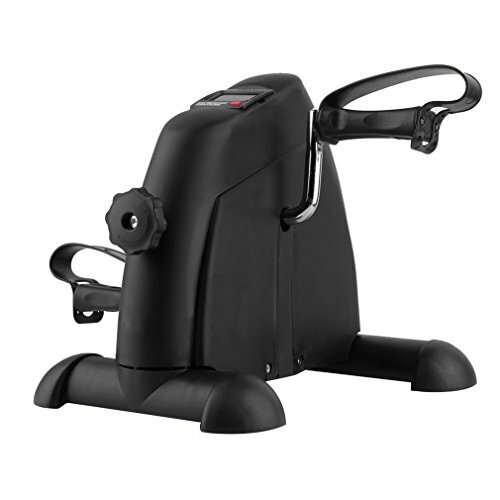 Non-slip, nonmarking feet ensure the pedal exerciser stays in place on any surface, including any tabletop, carpet or hard floor surfaces. The low profile design keeps the pedal exerciser from wobbling and sliding while in use. 【ADJUSTABLE RESISTANCE】Easily adjust the resistance level with the tension knob for a personalized exercise experience. Great low impact exercise for beginners and perfect for rehabilitation following a surgery or injury. 【MULTI FUNCTION LCD DISPLAY】 A large, easy to read LCD screen displays RPM, time, speed, distance and calories burned with the touch of a button that is easily accessible while in use. 【100% SATISFACTION GUARANTEE】We provides a 100% risk free lifetime guarantee on our Pedal Exerciser, no questions asked If you meet any problem, just let us know, and we'll take care of it for you until you satisfied! We cannot guarantee our current special pricing, so be sure to Click Buy Now!